Union leaders and conservation activists are protesting a leaked internal BNSF Railway memo offering compensation to employees who turned out at a Wednesday public meeting in support of the second Lake Pend Oreille rail bridge. A screenshot of the internal BNSF memo leaked to the Sandpoint Reader. 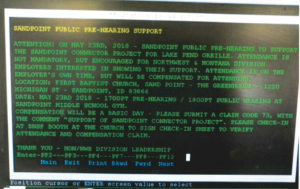 Captured off a BNSF terminal, the memo is directed to Northwest and Montana Division BNSF employees available to attend the pre-hearing for the Sandpoint Connector Project at First Baptist Church and the public hearing at Sandpoint Middle School Gym. 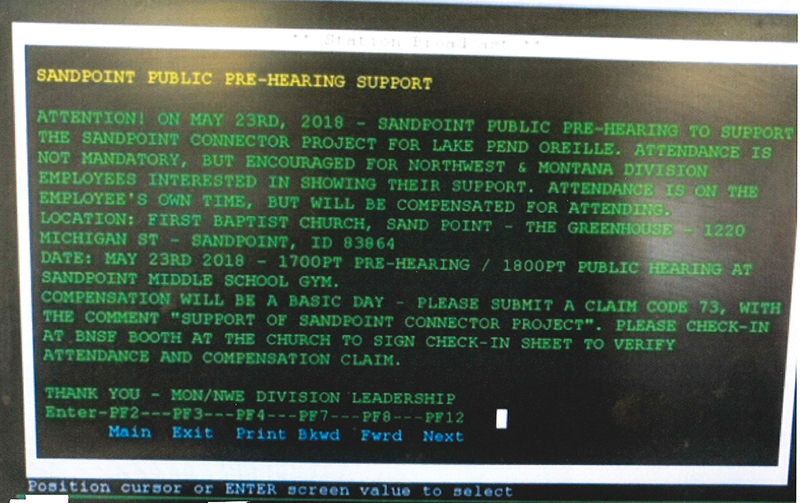 The memo offers compensation for a basic day and requires employees to submit a claim code with the comment “support of Sandpoint Connector Project,” as well as a sign-in at the event to confirm attendance. “Attendance is on the employee’s own time, but will be compensated for attending,” the memo reads. Courtney Wallace, BNSF director of public affairs, expanded on the statement at the pre-hearing event. The memo leaked when an anonymous BNSF employee photographed the terminal and sent it to Herb Krohn,Washington State legislative director for the Transportation Division of the Sheet Metal, Air, Rail and Transportation Workers Union, or SMART. The image then made its way to Michael Elliott, a former employee and whistleblower who is engaged in a court battle with BNSF for alleged wrongful termination, and Laura Ackerman of The Lands Council. Krohn claims the compensation offer is a reaction to poor employer-employee relationships between BNSF and its workers. According to Krohn, the employee dissatisfaction stems from safety issues and a method of assigning runs with little forewarning, making it difficult to plan life around work and forcing employees to make personal sacrifices for their jobs. In general, SMART is supportive of projects that boost commerce and add jobs within the industries it serves, Krohn added. However, he said that because employees are unhappy, support for the project isn’t growing organically, making the compensation offer a necessity. “What they did was they just decided to bribe the members on their own by offering them money to go to the hearing,” he said. “I think that if relations were better and morale were higher and there was a better degree of trust, it would not be an issue to get BNSF employees to support this project,” he added. Elliott, another early recipient of the leaked memo, echoed Krohn’s comments. The Seattle Times reports that in 2015, he was awarded $1.25 million by a federal jury in Tacoma. In a six-day trial, Elliott maintained he was unlawfully fired and his character was besmirched by BNSF officials after he reported dozens of safety violations to the Federal Railroad Administration. Elliott claims the leaked memo is more evidence of BNSF failing to address the fundamental concerns of its workforce. “Why would we try to help you when all you do is make our lives less safe?” Elliott said. Local opponents of the Sandpoint Connector Project were also disheartened by the BNSF memo. The Sandpoint Connector Project remains a controversial proposal among local residents. Supporters believe that since train traffic is driven by demand, the second bridge will be necessary to curb track congestion and vehicle wait times at crossings. Opponents, on the other hand, say the second bridge will bring an increased chance of derailment over Lake Pend Oreille, which could potentially spill hazardous substances into local waterways.